This advanced mobile computer is small, lightweight and rugged and is designed for applications and environments requiring high-quality data capture and high-performance real-time computing. Customise this device to the specific demands of individual jobs, allowing employees to complete their work faster and with better results. The well-balanced brick form factor is ideal for scan-intensive environments, offering the best in comfort for workers throughout an entire shift. 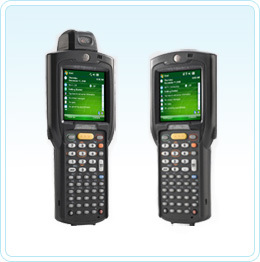 The MC3000 excels at bar code scanning and wireless mobile computing within retail stores, warehouses, on loading docks, postal routes or any location demanding application performance and ruggedness. Reduces user fatigue for higher productivity in scan-intensive applications. Comfortable to use in intensive scan environments for prolonged periods. User can adjust the scanning positions for maximum comfort and productivity. 30% higher resolution than 1/4 VGA allows easy viewing in many environments for increased accuracy. Provides real-time data exchange for maximum productivity. Enables use of and wireless connection to a range of devices. Withstands multiple 4 ft drops (1.2m) to concrete and up to 500 tumbles. Protects against water and dust for reliable performance in rough environmental conditions. Delivers high-speed CPU performance through familiar interfaces with wide software application support. Provides multiple data entry modes for maximum efficiency. Enables real-time monitoring of critical mobile computer and wireless infrastructure parameters. For a complete list of all MC3090 accessories click on the button below. How to warm boot the MC-3000? How do I cold boot the MC-3000? Does the Wavelink client come pre-licensed on the MC-3090 brick? No. You have to purchase this separately. On the MC-3090 gun (pistol) version the Wavelink telnet client comes pre-licensed.